Life's circumstances have me coming back to a piece of property that my mother left me. What exactly does your group do? Unfortunately I work every weekend. It sounds as if you got to the meeting this past week. How many people are in this group? 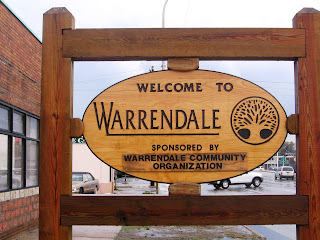 The short answer to your first question is that the Warrendale Community Organization is a grassroots organization that strives to make life better for those who live, work or visit in Detroit's Warrendale neighborhood. Our current emphasis is on improving police response times and on resolving the number of vacant homes in our neighborhood. There are currently a little more than 20 dues paying members of the WCO, although we are currently in launching a drive to bring that number up. For example, at our March general membership meeting, I as president of the WCO challenged every member to bring one more person with them to the April meeting. The WCO holds its general membership meetings on the first Monday of each month in the school building at St. Thomas Aquinas Church, beginning at 7 p.m. The next one will be on Monday, April 7. Everyone in the neighborhood is welcome to attend. I represent a neighborhood association just west of you, we are having many of the same concerns as your neighborhood it appears (like vacant houses) we are a smaller neighborhood house wise (only 1268 homes) but about 115 are vacant. I am curious how your organization is dealing with the problem (I saw quite a few on evergreen btwn warren and tireman. I am in a simular situation as Hellen wrote in your post. I am currently trying to renovate my fathers 2-family home to rent or sell. However I am concerned with the vacant homes, some of which have been broken into and burned. Does the community make an effort to watch these homes? I understand that your group is a grass roots organization, but would like more information. When is your next meeting, and is it open to anyone?